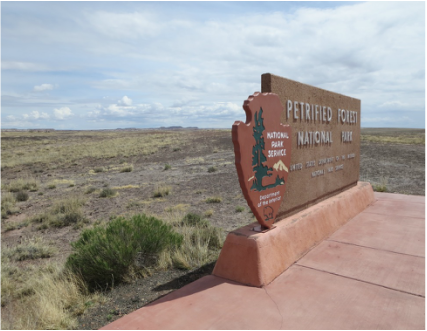 ​A detour through the length of Petrified Forest National Park is a worthwhile hour or two drive that traverses geological formations dating back more than 200 million years. But shorter excursions into the park are also rewarding. It is one of the largest concentrations of petrified wood in the world, along with North Dakota, Argentina and Egypt. The tallest fossilized, downed trees in the park are close to 140 feet. An elderly Navajo weaver was demonstrating her craft on a recent visit to the inn. There's also an ice cream shop on the bottom level that's a nice treat on a hot day. Petrified Forest is the only national park that had a stretch of Route 66. A section of the road north of the Visitors Center was plowed under but broken bottles and other debris from Route 66 motorists is scattered on both sides of the old road alignment. The Visitor Center is a 1963 building designed by notable California architect Richard Neuta. It was built as part of the Mission 66 program President Eisenhower's administration launched in the mid-1950s to upgrade national park facilities. The designs are deliberately in contrast to the park landscapes. The center has been altered and shows signs of aging but the Park Service is restoring original design elements. ​Westbound motorists on Interstate 40 should use Exit 311 to visit the park. Eastbound motorists can Exit 285 at Holbrook to reach the park from the south. 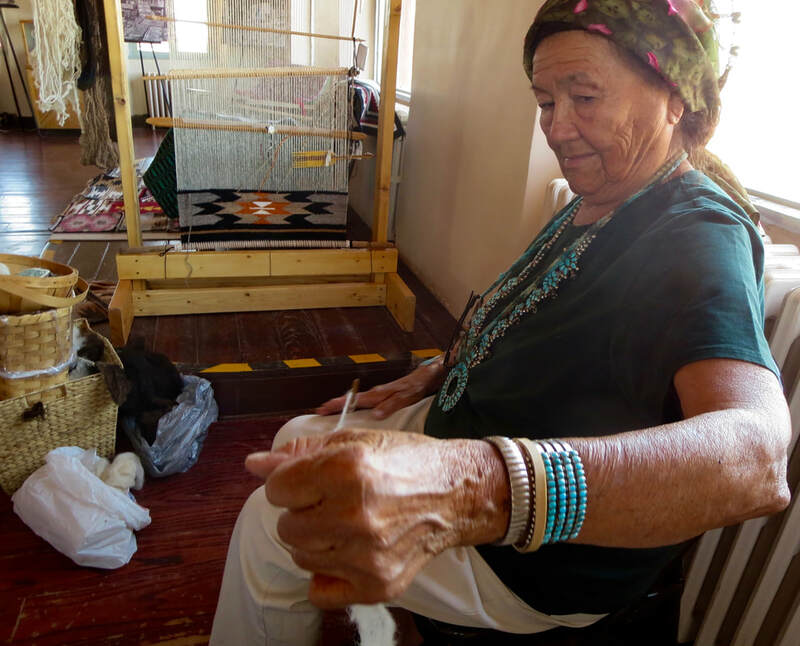 A Navajo weaver spins yarn at Painted Desert Inn. The Tepees area of the park includes layers of gray, blue, purple, and green mudstones and sandstones deposited more than 220 million years ago. 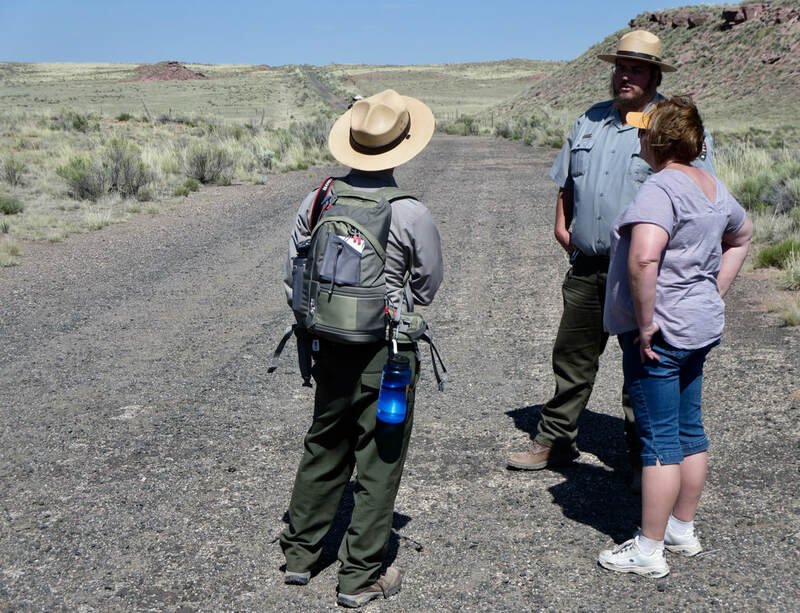 Rangers and a visitor during a tour of former Route 66 sites. This is on an old alignment of the highway east of the national park. 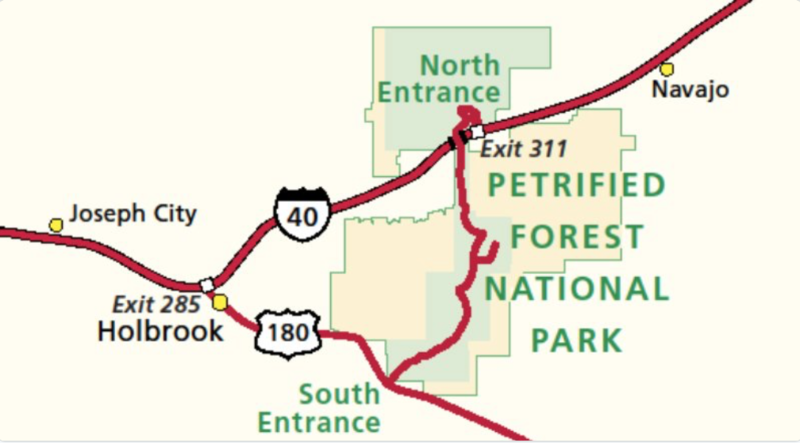 Visitors can travel north to south through the park from Interstate 40 to U.S. 180 to Holbrook or enter from the south and return to I-40. 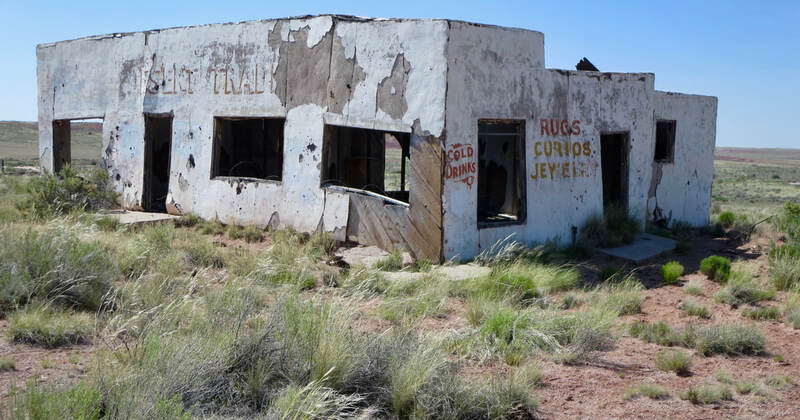 The Painted Desert Trading Post reportedly opened as early as 1942 and closed circa 1956. It is till standing, but barely. Petrified Forest is the only national park that included a stretch of Route 66. Painted Desert Inn (right), built in 1920, closed in 1963 and was nearly razed in the 1970s. The inn reopened in 2006 after a major renovation. Signature fossils in the park are fallen trees in river channels that were trapped in sediment in the Chinle Formation.